Paxton Williams, 9, sits at his Cozy Christmas hot cocoa stand Monday morning in front of his grandmother’s house on Quay Avenue. Paxton, of Castle Rock, Colo., has been setting up the stand on Christmas Eve during visits to grandma’s for four years, hoping to bring Artesia love, joy, and a warm, tasty treat during the holidays. 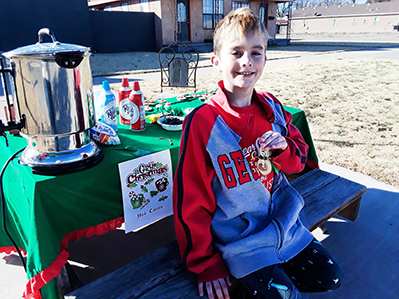 Paxton also crafts ornaments that are given away to his customers and offers a variety of topping options for the cocoa.